emutel Maestro brings you the perfect solution for testing your DSL equipment. Connect to your product while still in your own testing lab and perform those final tests in a real environment, enabling you to identify and solve any problems before they occur on site. emutel Maestro is a cost-effective network simulator for development, test and demonstration of ADSL, SHDSL and VDSL equipment. 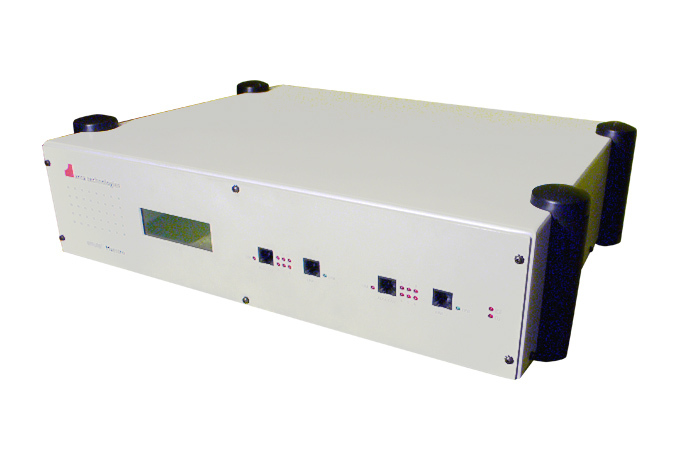 The emutel Maestro is a self-contained 2 port DSLAM simulator for ADSL, SHDSL and VDSL. The fully flexible design of emutel Maestro supports different manufacturers' chipsets using independent plug-in modules. The unit can emulate different types of xDSL and is therefore ideal for product development and product testing. Emutel Maestro provides a standard platform to carry out performance testing, functional verification, interoperability and conformance testing of CPE equipment - all in one box! Emutel Maestro provides simulation of two Central Office xDSL lines, running over real analog and ISDN lines. On both, you can simultaneously connect your DSL and telephone equipment, effectively testing ADSL SHDSL or VDSL running over copper wires in a laboratory environment. 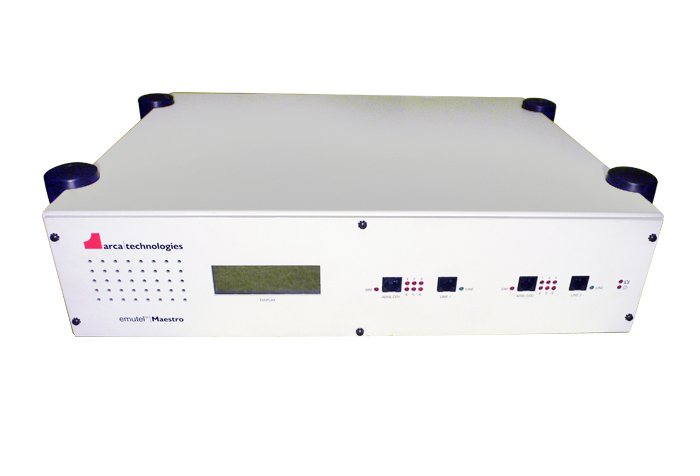 The DSL datasource is provided by a high speed UTOPIA level 2 interface, ATM 155 and LAN, enabling third party equipment to send and receive data from the DSL lines. In addition an internal web server allows operation in standalone mode. Engineers in a development environment may want to run different applications, e.g. VoIP software, web server or video on a PC. Whenever you test ADSL equipment, plug into the Emutel Maestro and the PC acts as a data generator. For lengthy testing of CPE, the statistical generation and logging functionality of the Emutel Maestro enable you to continuously monitor operating conditions and view and record event changes. Use Emutel Maestro in standalone operation and connect to a web server running internally. Perfect for modem demonstrations and production tests. Different manufacturers’ chipsets and the ability to have different types of xDSL in one unit make Emutel Maestro ideal for product development and interoperability testing. Emutel Maestro can be controlled using a command line interface or with a graphical Windows application program displaying statistical information and allowing extensive device configuration. Emutel Maestro is completely controllable using an RS232 or Ethernet port. Emutel Maestro emulator/simulator is extremely easy to use with indicator LEDs and helpful information LCD showing at a glance what each DSL port is doing. At just 5.3kg, Emutel Maestro emulator/simulator is easily portable and is the ideal system for use at demonstrations, presentations, exhibitions and production line testing. Price and availability of Emutel Maestro can be requested by contacting the arcatech. emutel Maestro - Maestro ADSL, VDSL Simulator Presentation.